Garnier Micellar Water // RMK Rose Cleansing Balm // First Aid Beauty Facial Radiance Pads // Melvita Organic Rose Beauty Mist // Caudalie Premier Cru The Eye Cream // Caudalie Vinosource SOS Thirst Quenching Serum // Origins Mega Mushroom Skin Relief Soothing Face Cream // Origins Drink Up Intensive Overnight Mask. 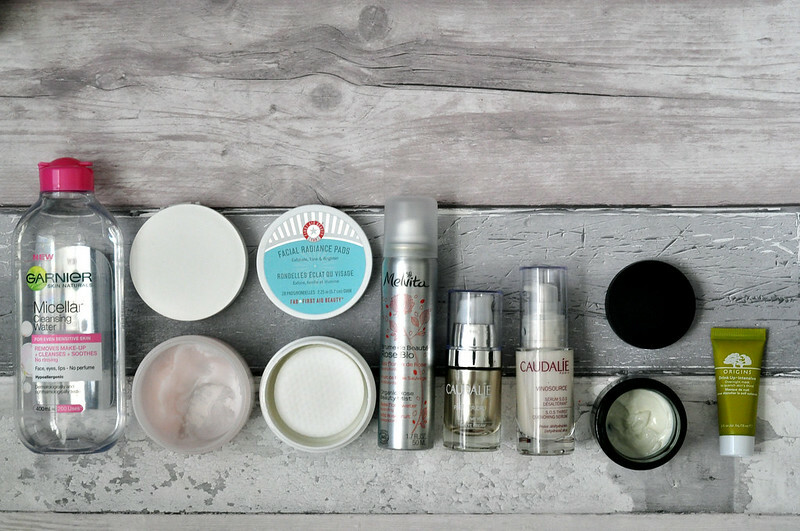 This month there's been a few changes to my skin care routine. You can see last months here but since then I've finished both my toner and serum so I've started using a rose toner from Melvia and my good old Caudalie Vinosource serum. Another new product this month, which I was actually using last month but forgot to photograph it is the First Aid Beauty pads. It's my first time trying an acid exfoliator and so far so good. My sensitive skin hasn't been reacting to them luckily and they've really helped with any spots I've had. This months mask has been the Origins overnight mask which has been a life saver and has really helped my dry skin. I've nearly finished my cleanser and moisturiser as well so by next month I'll probably have a whole new skin care routine. I'm trying to use the same products until they're finished as my skin reacts better to consistency and routine. Plus I still have a lot of products to finish before buying anything new so I'm trying to not open any new products until others are empty. So far it's working well! I am so tempted to try both the FAB pads and the Caudalie serum now! *touch wood* my skin has been pretty well behaved recently but exfoliation isn't something I have really settled on! I love this, it's a great way of keeping track and knowing what you truly will want/need to repurchase in the future!